The Blackmagic Design Micro Studio Camera 4K is a mind-blowingly small Ultra HD professional camera designed for studio use. In times gone past it was unfortunately necessary to compromise on image quality in pursuit of an ultra compact camera solution. That is no longer the case. The Micro Studio Camera 4K delivers incredible images up to 2160p30 and supports SDI camera control protocol, allowing full remote control via a single SDI connection. Without compromising on image quality, its compact size enables the Blackmagic Micro Studio Camera 4K to be used pretty much anywhere. Home televisions can now support Ultra HD imagery and the Micro Studio Camera can handle comfortably– it’s perfect for any live multi camera production. Virtually invisible and capable of being hidden just about anywhere on set, this micro camera delivers more camera angles than any other before it. You can even conceal it on stage for incredible shots of live performances or, because it’s so small, safely fly it overhead during sporting events. The Studio Camera 4K can, as its name suggests, also be used in the studio by rigging it with a professional broadcast lens and a Blackmagic Video Assist for monitoring. Using the Micro Four Thirds lens mount makes the Micro Studio 4K compatible with a widest range of third party lenses, and using the simple B4 adaptor permits standard television lenses as well. Active MFT photo lenses are designed to be small, light weight and produce super sharp images at a much higher resolution than traditional video lenses, making them perfect for Ultra HD. They can be remotely controlled using the return SDI program feed from your ATEM switcher or from the expansion port on the camera. It’s even possible to add a lens mount adapter to use feature film style PL lenses. 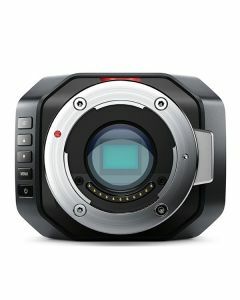 The Blackmagic Design Micro Studio Camera 4K provides standard broadcast connectivity including a full size HDMI connector for local video monitoring. There is a mini BNC connector for the main camera SDI output and a mini BNC connector for the camera program input which can be used to provide reference, control camera CCU settings, return talkback audio and tally status. There is a 3.5mm mic input for external microphones and a 3.5mm headphone socket that supports an iPhone compatible mic for talkback.